Sarnath near Varanasi served as the Karma Bhoomi of Lord Buddha. A prominent site of Buddhist pilgrimage, Sarnath was the place where Lord Buddha after enlightenment delivered his first sermon of Middle Path. One of the most celebrated pillars is the pillar with the lion capital at Sarnath by Emperor Ashoka circa 250 BC, also called as Ashoka Column. Here, four lions are seated back to back. At present the Column remains in the same place where are the Lion Capital is at the Sarnath Museum. This Lion Capital of Ashoka from Sarnath has been adopted as the National Emblem of India and the wheel Ashoka Chakra from its base was placed onto the center of the National Flag of India. Chaukhandi in Sarnath is a site of an important stupa enshrining the relic of Buddha. Dhamek in Sarnath hosts a massive stupa marking the exact spot of deer park, Rishipattana where Buddha gave the first sermon to his five disciples after enlightenment. According to recovered inscriptions, the site name was Dharma Chakra Stupa. The ruins of the Mulagandhakuti vihara mark the place where the Buddha spent his first rainy season. The present day Mulagandhakuti consists of a monastery built by Sri Lankan Mahabodhi Society in 1930. Sravasti was one of the prominent cities in India during Buddhas time. Jetavana in Sravasti was the famous monastery where Buddha gave majority of his discourses and spent 20 rainy seasons. 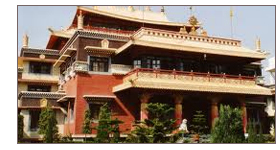 Kushinagar in Eastern UP is one of the four sacred pilgrimage destinations for Buddhists. Here only, Great Lord Buddha, founder of Buddhism, delivered his last sermon. The famous Mahaparinirvana Temple houses a statue of Buddha reclining on his right side, representing his Mahaparinirvana. Nirvana Stupa in Kushinagar is a huge brickwork stupa enshrining the Lord Buddha remains, right next to Mahaparinirvana Temple. This bell-shaped stupa symbolizes the Buddha's complete absorption into the highest state of mind. Ramabhar Stupa in Kushinagar was the cremation site of Lord Buddha. Located around the Mahaparinirvana Temple, Ruins & Brick Structures feature remains of various monasteries of different sizes constructed from time to time during the ancient period. Located in northern Uttar Pradesh, Mathura, the birth land of Lord Krishna was also associated with Buddha. Lord Buddha himself visited this pious hamlet on the banks of River Yamuna. A visit to this sacred land is a must for Buddhist tourist as here only Buddhist art flourished under the Mathura art style since a thousand year ago, making the village a great center for Buddhist art. The sacred land of Kaushambi is connected with Buddhism in a deep way. Lord Buddha after enlightenment spent his sixth and ninth year and delivered some important sermons in Kaushambi. Prabhosa near Kaushambi dwells around a hill where Buddha spent his sixth rains retreat in contemplative state. It is the reason why no discourses or sermons are associated with Prabhosa. Currently, the site is a home to many caves and rocks blessed with peace. Sankassa is the site where Lord Buddha descended back to earth from Tautisa Heaven after preaching Abhidhamma to his mother Maya. Present day Sankassa hosts ruins of old monasteries and Buddhist monuments which were built during the time of Emperor Ashoka. Kapilvastu was the kingdom of Sakyas, the clan of Prince Siddhartha or Gautama Buddha. Lord Buddha spent nearly 29 years of his life in this district.